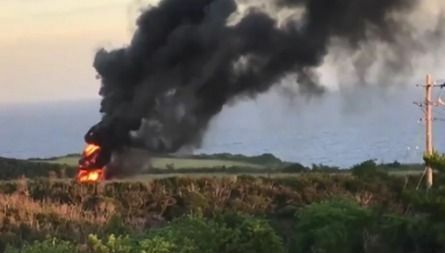 At around 5:20 p.m. on October 11, a U.S. Marine CH-53E heavy-lift transport helicopter belonging to the U.S. Marine Corp Futenma Air Station was forced to land on pasture in Takae near the U.S. military Northern Training Area, Higashi Village, Okinawa, and burst into flames. According to the Kunigami district firefighting union headquarters, at about 5:35 p.m. local residents informed them that a U.S. military plane had crashed in Takae. The U.S. Marine Corps in Okinawa announced that a U.S. Marine CH-53E had made an emergency landing after catching fire during a training flight. Neither local residents nor the seven crew members were injured. The accident occurred in civilian areas near the prefectural highway No. 70 and about 200 meters away from the nearest private residence. Helicopters circled over the scene to put out the blaze, and Kunigami district firefighters sprayed water on the area. It was confirmed that the fire was completely put out by 8:17 p.m.